TLB Editorial note: In the following video and article, Activist/Researcher Jim Lee puts the “Deep State” narrative into understandable context. TLB readers know Lee for his meticulous research and presentations on the subject of GeoEngineering here at TLB as a Contributor/Advisor and at Climate Viewer.com. Jim Lee has several buttons you can push and get an immediate reaction. One being if you are telling a lie and another is if you “are being stupid” by choice or default. Lee’s journey in activism has been to focus on one area… take a few steps back… focus on still a wider horizon… keeping in mind there is a bigger picture and more dots to connect before that picture is complete. War leads to the erosion of liberty for the benefit of the military-industrial complex. World War II set in motion the destruction of privacy and the formation of an Orwellian Police State controlled by the National Security Agency (NSA) of the United States of America. Under the guise of cooperation and mutual respect, countries signed secret agreements with the NSA to share signals intelligence (SIGINT) which in layman’s terms means your phone calls, instant messages, and more. Shortly after World War II, the United States and its allies built the ECHELON system to spy on land and satellite-based communications worldwide. 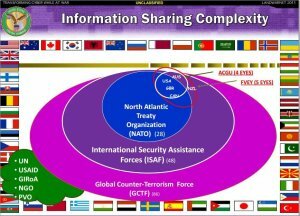 Their closest allies, dubbed The Five Eyes (FVEY), received privileged treatment from the NSA community wherein these five countries share resources on a grand scale. The Five Eyes are also know as AUSCANNZUKUS, short for AUStralia, CANada, New Zealand, UK, and US. As time progressed the Five Eyes added two more tiers to their club: the Nine Eyes and Fourteen Eyes. The Fourteen Eyes are officially known as SIGINT Seniors Europe, or “SSEUR” but I think we can unofficially call them: The New World Order. This Anglosphere-based NWO group is now hell-bent on a United Nations based one-world government, with a single digital currency worldwide, and a completely disarmed populace. The recent Snowden-disclosures should be enough to wake the people, however informal gas station polls show that Average Joe has no clue. Each member of The Fourteen Eyes of the New World Order is subservient to the Five Eyes, and all other nations are enemies of the one-world government. To see this any other way is to have eyes and yet be blind. Occupy Wall Street suffered a similar fate. Through a combined lame-stream propaganda campaign and targeted domestic spying by the Department of Homeland Security, the will of the people was mocked, shunned, and silenced. The Fourteen Eyes form a freedom-slaying Voltron that is worse than Orwell’s nightmares and what Willis was talkin’ about. The Fourteen Eyes feed a brain in Nevada at the Utah Data Center. The NSA uses this massive database to silence activists, silence Congressmen, and even silence Generals. Still the question remains, who controls the NSA? How can any progress toward less government, less war, free energy, more freedom, and common abundance ever occur when globalist ideologies and Big Brother are hell-bent on destroying our borders, taking our guns, and ensuring nothing you do can stop our progress towards a one-world government. The Fourteen Eyes will have their New World Order so don’t protest, buy the GMO corn, and go shopping, stay scared! How does America spy on America? Use the GCHQ! Britain’s GCHQ intelligence agency can spy on anyone but British nationals, the NSA can conduct surveillance on anyone but Americans, and Germany’s BND foreign intelligence agency can spy on anyone but Germans. That’s how a matrix is created of boundless surveillance in which each partner aids in a division of roles. Canadian Forces Sub-Lt. Jeffrey Paul Delisle walked into the Russian Embassy in Ottawa in 2007 and offered to sell secrets to that country’s military intelligence agency, beginning an espionage career that lasted almost four years, according to court details revealed by CBC News after the naval officer pleaded guilty to spying. Delisle, 41, pleaded guilty in a Halifax court Wednesday to breach of trust and two counts of passing information to a foreign entity between July 2007 and Jan. 13, 2011, in Ottawa and Kingston, Ont., and Halifax and Bedford, N.S., where he lived. According to previously unpublished material from a bail hearing, Delisle walked into the embassy wearing a red ball cap and civilian clothes. He flashed his Canadian military identification and asked to meet with someone from GRU, the Russian military intelligence. Delisle was posted to the security unit HMCS Trinity, an intelligence facility at the naval dockyard in Halifax. It tracks vessels entering and exiting Canadian waters via satellites, drones and underwater devices. While there he worked on a system called the Stone Ghost, said CBC reporter Rob Gordon. “It’s a computer system that links the five eyes. The five eyes are the United States, Britain, Australia, New Zealand and Canada. All their information is shared on the Stone Ghost computer. StoneGhost for hire by U.S. Corporations? On behalf of the British Prime Minister Margaret Thatcher, the Canadian Security Intelligence Service of Canada spied on two British cabinet ministers in 1983. The U.S. National Security Agency spied on and intercepted the phone calls of Princess Diana right until she died in a Paris car crash with Dodi Fayed in 1997. The NSA currently holds 1,056 pages of classified information about Princess Diana, which has been classified as top secret “because their disclosure could reasonably be expected to cause exceptionally grave damage to the national security … the damage would be caused not by the information about Diana, but because the documents would disclose ‘sources and methods’ of U.S. intelligence gathering”. An official insisted that “the references to Diana in intercepted conversations were ‘incidental’,” and she was never a ‘target’ of the NSA eavesdropping. U.K. agents monitored the conversations of the 7th Secretary-General of the United Nations Kofi Annan. U.S. agents gathered “detailed biometric information” on the 8th Secretary-General of the United Nations, Ban Ki-Moon. In the early 1990s, the U.S. National Security Agency intercepted the communications between the European aerospace company Airbus and the Saudi Arabian national airline. In 1994, Airbus lost a $6 billion contract with Saudi Arabia after the NSA, acting as a whistleblower, reported that Airbus officials had been bribing Saudi officials to secure the contract. As a result, the American aerospace company McDonnell Douglas (now part of Boeing) won the multibillion-dollar contract instead of Airbus. The American defense contractor Raytheon won a US$1.3 billion contract with the Government of Brazil to monitor the Amazon rainforest after the U.S. Central Intelligence Agency (CIA), acting as a whistleblower, reported that Raytheon’s French competitor Thomson-Alcatel had been paying bribes to get the contract. In order to boost America’s position in trade negotiations with the then Japanese Trade Minister Ryutaro Hashimoto, in 1995 the CIA eavesdropped on the conversations between Japanese bureaucrats and executives of car manufacturers Toyota and Nissan. HBGary Federal, a US defense department cyber security firm, was hacked (allegedly by a 16 year old girl) and its emails were uploaded to torrents and websites. In those emails, the public learned that prominent law firms hired Berico Technologies, Palantir Technologies, and HBGary to create fake Facebook, Twitter, and YouTube accounts to post online as if they were real people and influence your opinion. 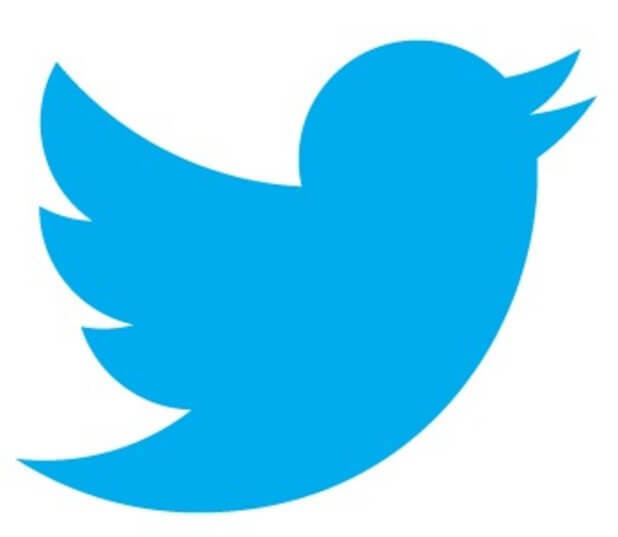 One person can run more than 50 different accounts, all with complete “online” life histories to add authenticity. Their purpose? Discredit all associated with Wikileaks through coercion and convince the public that Wikileaks, Glenn Greenwald, and Julian Assange are terrorists. 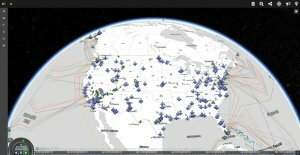 The U.S. government uses StoneGhost, the United States SIGINT System (USSS),  and Fourteen Eyes mass surveillance to attack, harass, and intimidate citizens on behalf of U.S. based corporate interests. Moratoriums on Monsanto’s famous “MON 810” genetically modified (GMO) corn are being passed all across Europe due to people’s belief that these products are unsafe. Instead of respecting the people’s will, our state department considers making a “target retaliation list that causes some pain across the EU” to help out their struggling buddies at Monsanto. 4. (C) France’s new “High Authority” on agricultural biotech is designed to roll back established science-based decision making. The recently formed authority is divided into two colleges, a scientific college and a second group including civil society and social scientists to assess the “common interest” of France. The authority’s first task is to review MON 810. In the meantime, however, the draft biotech law submitted to the National Assembly and the Senate for urgent consideration, could make any biotech planting impossible in practical terms. The law would make farmers and seed companies legally liable for pollen drift and sets the stage for inordinately large cropping distances. The publication of a registry identifying cultivation of GMOs at the parcel level may be the most significant measure given the propensity for activists to destroy GMO crops in the field. 5. (C) Both the GOF and the Commission have suggested that their respective actions should not alarm us since they are only cultivation rather than import bans. We see the cultivation ban as a first step, at least by anti-GMO advocates, who will move next to ban or further restrict imports. (The environment minister’s top aide told us that people have a right not to buy meat raised on biotech feed, even though she acknowledged there was no possible scientific basis for a feed based distinction.) Further, we should not be prepared to cede on cultivation because of our considerable planting seed business in Europe and because farmers, once they have had experience with biotech, become its staunchest supporters. Let it be known: if you are an anti-GMO activist living in the United States of America or abroad, the full might of the Fourteen Eyes, the NSA, and the StoneGhost surveillance machine will bear down on you in defense of Monsanto. How many more companies are on the “cool kids” list? Nothing is private. Nothing is secure. The Eyes of the New World Order are watching. You have been warned. 1921 July 29 – The Council on Foreign Relations (CFR)  is an American nonprofit, nonpartisan membership organization, publisher, and think tank specializing in U.S. foreign policy and international affairs. The CFR is considered to be the nation’s “most influential foreign-policy think tank”. Its membership has included senior politicians, more than a dozen Secretaries of State, CIA directors, bankers, lawyers, professors, and senior media figures. The CFR regularly convenes meetings at which government officials, global business leaders and prominent members of the intelligence/foreign-policy community discuss major international issues. The council also publishes the bi-monthly journal Foreign Affairs, and runs a think tank called the David Rockefeller Studies Program, which influences foreign policy by making recommendations to the presidential administration and diplomatic community, testifying before Congress, interacting with the media, and authoring books, reports, articles, and op-eds on foreign policy issues. to secure to all peoples the right to develop according to their own customs and traditions. 1940 – British Security Coordination (BSC)  was a covert organization set up in New York City by the British Secret Intelligence Service (MI6) in May 1940 upon the authorization of Prime Minister Winston Churchill. Its purpose was to investigate enemy activities, prevent sabotage against British interests in the Americas, and mobilize pro-British opinion in the Americas. As a massive propaganda campaign, the BSC influenced news coverage in the Herald Tribune, the New York Post, The Baltimore Sun, and Radio New York Worldwide. 1941 August – The Political Warfare Executive (PWE)  was a British clandestine body created to produce and disseminate both white and black propaganda, with the aim of damaging enemy morale and sustaining the morale of the Occupied countries. 1941 August – The Atlantic Charter  was a pivotal policy statement issued in August 1941 that, early in World War II, defined the Allied goals for the post-war world. It was drafted by the leaders of Britain and the United States, and later agreed to by all the Allies. The Charter stated the ideal goals of the war: no territorial aggrandizement; no territorial changes made against the wishes of the people; restoration of self-government to those deprived of it; free access to raw materials; reduction of trade restrictions; global cooperation to secure better economic and social conditions for all; freedom from fear and want; freedom of the seas; and abandonment of the use of force, as well as disarmament of aggressor nations. In the “Declaration by United Nations” of 1 January 1942, the Allies of World War II pledged adherence to this charter’s principles. 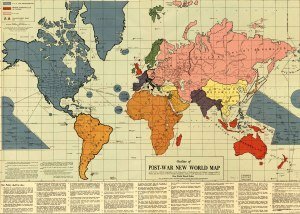 1942 February – The Outline of the Post-War New World Map was a map completed before the attack on Pearl Harbor and self-published on February 25, 1942 by Maurice Gomberg of Philadelphia. It shows a proposed political division of the world after World War II in the event of an Allied victory in which the United States of America, the United Kingdom, and the Soviet Union would rule. 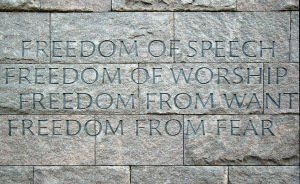 The map includes a manifesto describing a “New World Moral Order”, along with quotes from Roosevelt’s Four Freedoms speech. 1943 May 17 – BRUSA Agreement  was a formal agreement to share intelligence information. It covered the exchange of personnel and joint regulations for the handling and distribution of the highly sensitive material. The security regulations, procedures and protocols for co-operation formed the basis for all SIGINT activities of both the US National Security Agency and the British GCHQ. 1945 June – The United Nations (UN) is established. At its founding, the UN had 51 member states; there are now 193. The UN Headquarters is situated in Manhattan, New York City and enjoysextraterritoriality. Further main offices are situated in Geneva, Nairobi and Vienna. 1946 March 5 – The United Kingdom – United States of America Agreement (UKUSA)  is a multilateral agreement for cooperation in signals intelligence between the United Kingdom, the United States, Canada, Australia, and New Zealand. Membership is open to any American except persons Communist or Fascist oriented. 1949 April 9 – The North Atlantic Treaty Organization (NATO) , also called the (North) Atlantic Alliance, is an intergovernmental military alliance based on the North Atlantic Treaty which was signed on 4 April 1949. The organization constitutes a system of collective defence whereby its member states agree to mutual defense in response to an attack by any external party. NATO’s headquarters are in Brussels, Belgium, one of the 28 member states across North America and Europe, the newest of which, Albania and Croatia, joined in April 2009. An additional 22 countries participate in NATO’s “Partnership for Peace”, with 15 other countries involved in institutionalized dialogue programs. The combined military spending of all NATO members constitutes over 70% of the world’s defence spending. 1949 June 9 – George Orwell publishes 1984. His warnings were not heeded. 1954 May 29 – The Bilderberg Group , Bilderberg conference, Bilderberg meetings or Bilderberg Club is an annual private conference of approximately 120 to 140 invited guests  from North America and Europe, most of whom are people of influence. About one-third are from government and politics, and two-thirds from finance, industry, labour, education and communications. “The New World Order cannot happen without U.S. participation, as we are the most significant single component. 2001 September 11 – Fear overcomes America, rights dissolve, liberty disappears, surveillance explodes, Orwell nods. TLB recommends at visit to ClimateViewer News for more pertinent information. http://www.constitution.org/col/cuddy_nwo.htm – A CHRONOLOGICAL HISTORY OF THE NEW WORLD ORDER by D.L. Cuddy, Ph.D.